If you're using Surveys in Lattice, you can associate custom user data with your employees to analyze engagement survey data in the ways that best fit your needs. Step 3: Click on "Create custom field"
From here, you can give your custom field a name and set what choices the field should have. For example, if you wanted to associate an employee with their location to can compare survey results across different offices, you would name the field "Office" and set each office as a choice of that field. 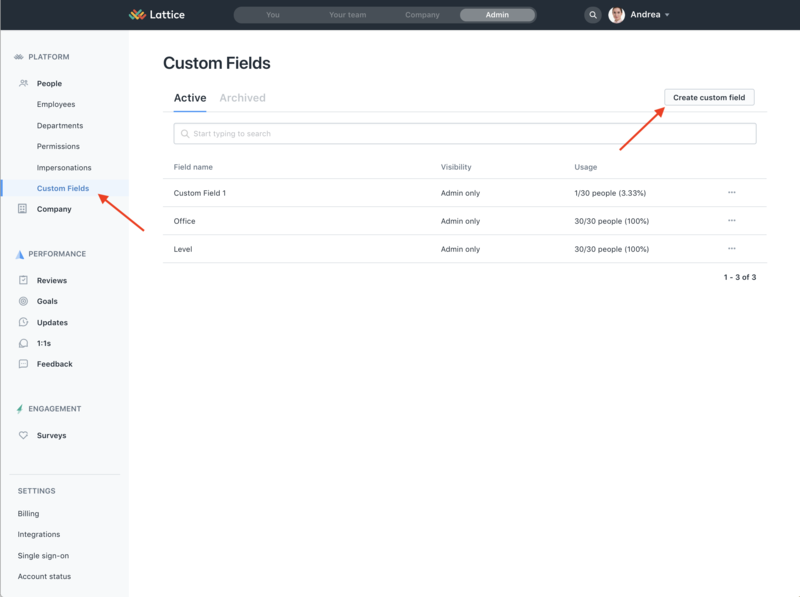 After you've created a custom field, you can change the choices by clicking View/Edit from the custom field management page. This will let you change the name of the custom field and remove choices. Removing a choice (ie removing an office location) will not affect users who currently have that set for that field, but will prevent new users from being assigned that choice. There are two ways to set values to custom fields for an employee. On a one-off basis, admins can edit the value of an employee's custom field from the People page in the Admin panel by finding an employee and clicking Edit Profile. To bulk change the custom fields of many employees at once, admins can upload a CSV (also from the People page on the Admin Panel) by clicking Upload CSV. 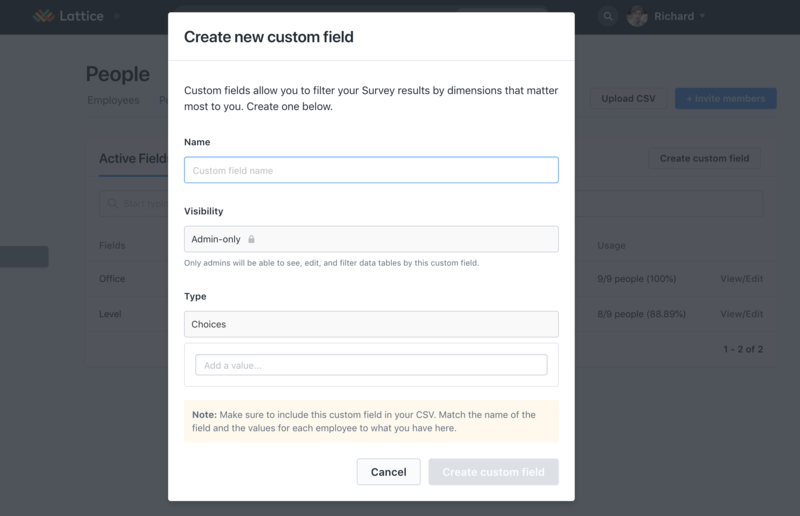 In the CSV, be sure to have a column for the custom field you want to change, and that all of the values for each employee are a valid option for that custom field. Note: At the moment, custom fields are only used in the context of survey analytics, and only admins are able to fill out custom user fields. We are currently working to expand this functionality in the near future!